Nearly two-dozen teams will compete in all-female regatta, Feb. 16-17. 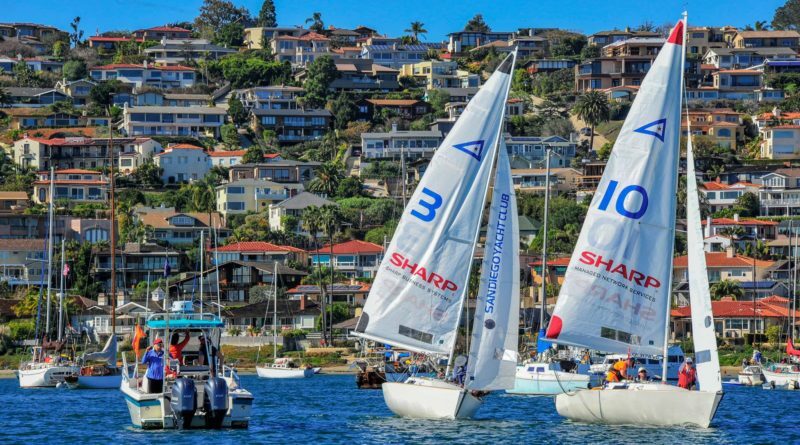 SAN DIEGO—J/22 type boats sailed by teams of three or four women will hit the water, Feb. 16-17, as San Diego Yacht Club hosts the Women’s Winter Invitational. The regatta will feature short fleet racing, with teams rotating boats. A rotation schedule will be posted in the event’s Sailing Instructions. Up to 24 teams are permitted to compete in this year’s Women’s Winter International; online registration ended on Feb. 7. All entries paid $100 to compete in the regatta and another $100 boat charter fee for practice and race days. Teams were also required to pay a refundable $1,000 damage deposit. La Playa Cove serves as the race area; the course is windward/leeward. The first warning signal will be at 10:30 a.m. Feb. 16, followed by a social event after racing. The same schedule will repeat on Feb. 17. Invitations to compete were sent out to various yacht clubs throughout 2018. There are 23 teams signed up for the invitational, including teams from the following yacht clubs: San Diego, Del Rey, Houston, Newport Harbor, New York, St. Francis, San Francisco, Acapulco, King Harbor, Richmond, Severn Sailing (Massachusetts), California, Southwest, Seattle and Rush Creek (Texas). Contact Regatta Chair Kris Zillmann at kris@sdyc.org for more information. San Diego YC’s website is www.sdyc.org.